Up to 1250 High Resolution Scans For 1 Low Price - With FREE Shipping! 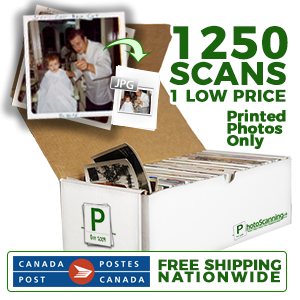 The PhotoScanning.ca EZ-Box is the easiest way for you to access our nationwide low pricing right from your door! Our sturdy shipping box is sent directly to you with a prepaid shipping label inside - fill the box with your photos, attach the label & bring to any Canada Post outlet - the photos are whisked away to our scanning facility in Toronto, Ontario, where we take about 2 weeks to digitize them to individual JPG files. Upon completion of the scanning, we create up to 5 DVD copies, any number of USB sticks, or a cloud delivery link for you to access your digital files, which are sent back to you along with the originals. Have more than 1250 photos? The EZ-Box gets even better the more you scan - save $25 off each additional box (thats $25 off your first, $50 off your second, $75 off your third additional box!). Due to mailing weight limitations, the additional $25 off promo is only applicable for up to 4 total boxes. All 600 DPI EZ-Boxes include an 8GB USB key for FREE for a limited time.